I’m sitting here watching the Republican National Convention feeling all proud of my own badass self. 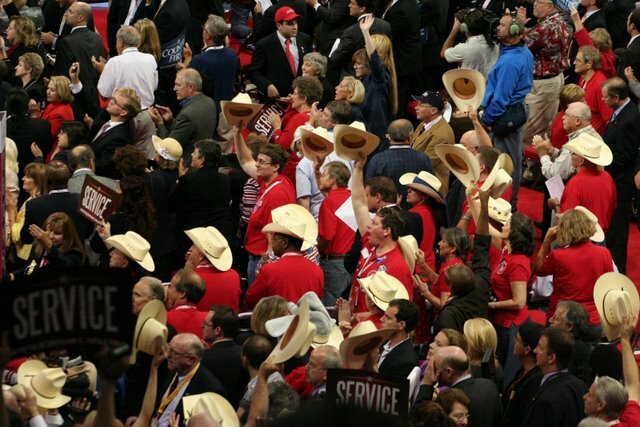 Jeez, I would never wear a dorky yellow cowboy hat like that, I think, or one of those tacky red blazers. I am waaaaaaay thinner than nearly everybody there except Sarah Palin, Cindy McCain, and Anderson Cooper. And I can outdance anybody in that stadium, young or old — crank that, baby! And then I remember: Oh right, they’re Republicans. Really devoted Republicans, in Minnesota. And what’s more shameful, I’m using them. That’s right, I admit it, I have absolutely no interest in Mike Huckabee’s speech. I do want to see Sarah Palin, and I’m hoping to get a glimpse of the hot baby-daddy, but I don’t know whether I’ll be able to stay awake that long. My real agenda here is using the Republicans as a coolness crutch. The really embarrassing thing is that I’m enjoying this more than most television shows I’ve watched lately. Tonight’s Project Runway, last night’s 90210, Monday’s Gossip Girl, Mad Men on Sunday: I love them, and yet they all make me feel old and ugly and fat and out of it. Not the Republicans. Watching the Republicans makes me feel as stylish as Rachel Zoe, as hot as Gisele Bunchen, as cosmopolitan as Amy Sacco, as cutting edge as Amy Winehouse. And that’s just wrong. Delicious, but wrong.